Don't Store Cake or Pancake Mixes for Long-Term Storage. Don’t Store Cake or Pancake Mixes for Long-Term Storage. 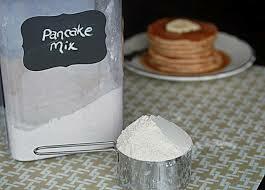 Recently I have been asked questions about the advisability of storing cake or pancake mixes and other similar items. My advice is not to, for several reasons. Now first I am talking about the cake or pancake mixes, you purchase at your local grocery store, not the canned products produced by reputable long-term food companies. One reason is that you have no control of what goes into the mixes. Many of them contain oils of different types, dairy and who knows what else. The labels on the packages often don’t give you enough information for you to make an intelligent decision about storing these products. Because it is a mixture, the shelf life is determined by the ingredient with the shortest shelf life. This in the case of oils it can be as short as a few months. Even packed in Mylar packs with oxygen absorbers, your shelf live may not be the best. I prefer to store the ingredients to make cake or pancake mixes separately. If something goes wrong with one of the ingredients, you can still make something from the remaining ingredients. I have read articles about people getting sick from these products being used well after their expiration date. Now I have not been able to find any hard fact on this, but suspect it was from improper storage that allowed mold to form. Another problem that I have read about is people saying that the baking powder loses it strength. I have not been able to verify this, but have found information that baking powder stored by itself will store for many years. Here is a link to a post that I did a couple of years ago that reference a study done by BYU on the shelf life of baking powder. The shelf life may be shorter when it is mixed with other products. My advice is if you want cakes and pancake store the ingredients separately packaged for long-term storage. Besides homemade baked goods, taste better than the store bought cake or pancake mixes. Toasting bread the old-fashioned way. This entry was posted in cooking and tagged Cake or Pancake Mixes. Bookmark the permalink. 5 Responses to Don’t Store Cake or Pancake Mixes for Long-Term Storage. I understand your concern and will head your advice…a little. I am aware of not buying ‘butter’ or cheese flavored potato flakes for long term storage as the dairy ingredients can go rancid, so I will look into your findings and go from there. Just FYI…We do store the separate ingredients also. Not as “long term” storage, but I have stored Bisquick, pancake mix, all-purpose flour and cornmeal, in its original cardboard or paper bag packaging, vacuum sealed in a plastic bag with an oxygen absorber and placed in the freezer for 4-5 years and it was OK. It is important to date and rotate stock. This was less intended as food storage than taking advantage of sales and keeping a quantity which could be used at the hunting camp or to donate for community food kitchens to feed the needy, though our church, and so far all has been OK using the old stock first. I actually found some of Emergency Essentials gallons of pancake had started to bulge slightly after about 4-5 years. I opened them and used them and they were ok but I wasn’t very happy about “20 year” cans showing bulging. We had that happen with Thrive Life pancake mix. I wonder if it might have been the same batch from the same food production plant.